Seasons greetings, dudes and dudettes! 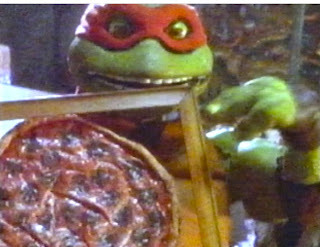 Welcome to the 1st day of The Sewer Den's awesome advent calendar, 24 Days of Turtle. Pulling no punches, I'm kicking Santa's sleigh into high gear from the start. 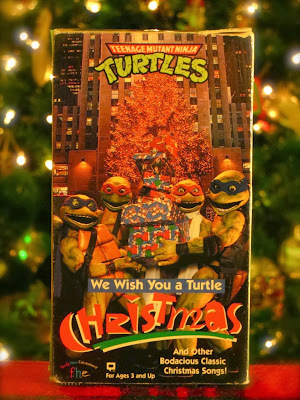 Rudolph's red nose guided Santa's sleigh, but only I can bring you back to the wonderful year of 1994 - when the world was given the gift of TMNT's We Wish You A Turtle Christmas. On this rickety VHS tape, typical Christmas carols are infused with a dose of cowabunga. But, Santa isn't the only jolly guy here. 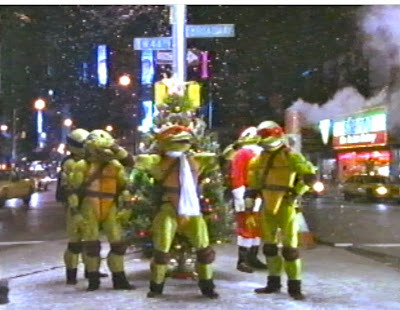 Our green heroes bring plenty of holiday spirit (and bad costumes) to keep you from being a scrooge. 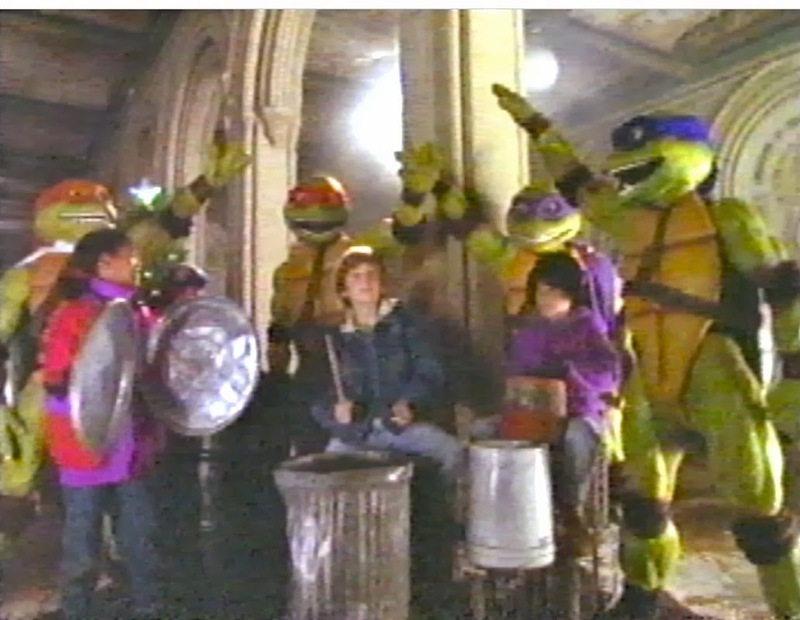 If you came to The Sewer Den searching for yuletide treasure, you're in luck. 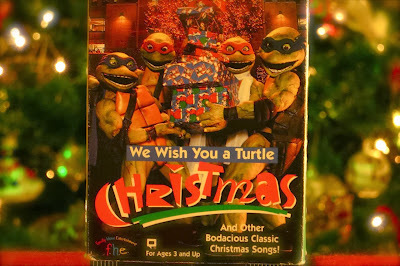 With the power of my old VCR, a Christmas miracle, and my love for the Turtles, I bring you ALL 9 TRACKS from We Wish You A Turtle Christmas available for download. This is most likely not legal, but I can't see Nickelodeon ever re-releasing this video. 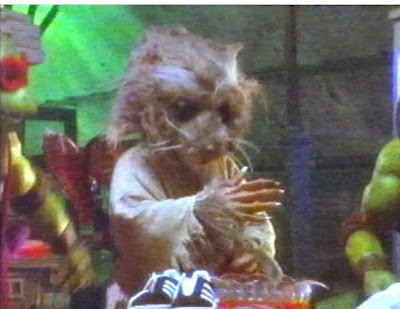 It's dated, small-budgeted, and riddled with nonsense. 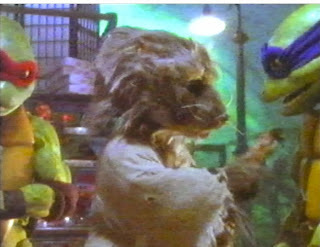 Not to mention Splinter's costume is downright frightening. Do a simple search and you can find all 25 minutes of the video online. 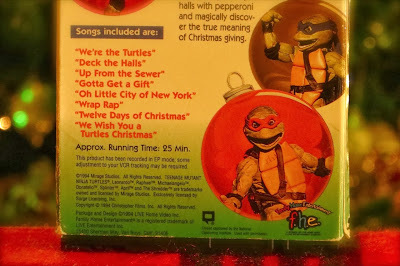 But, if you're seeking a silly album for this holiday season, look no further. 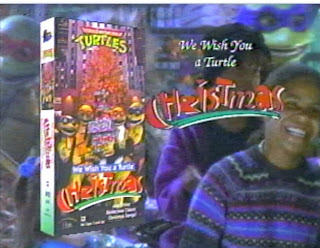 Download We Wish You A Turtle Christmas from The Sewer Den. Make sure to return tomorrow for Day 2 of 24 Days of Turtle! 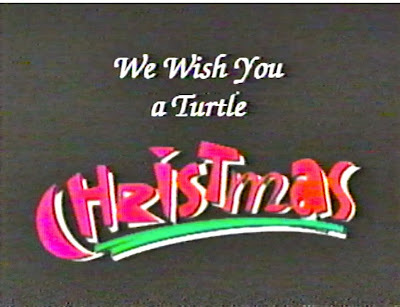 A few more seasonal screen grabs from the We Wish You A Turtle Christmas VHS. Enjoy! 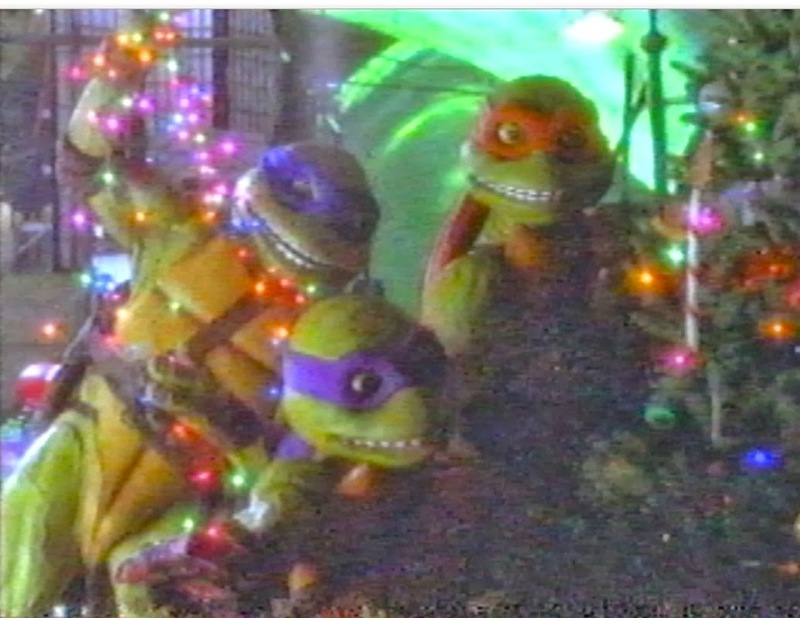 Ah, nice way to start off Day 1, with the turtle Christmas special already. 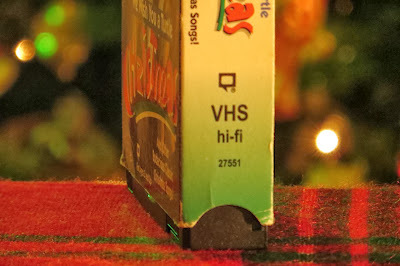 Does this mean we might see the 2K3's Christmas special on one of the days? I hope so. It's nice to see this, too. 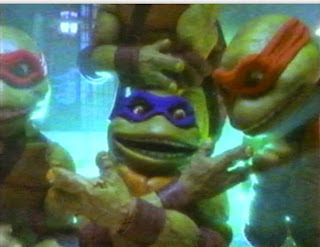 It's riddled with silliness overall, but it was a novelty (for it's time), and is nice to see it up here. I definitely need to watch it fully since it slips by my mind. Also, I don't think Nick/Viacom would go after you for this, you're not trying to make a profit off it anyways, just giving the fans something to enjoy. Hopefully the Santa of the Sewers brings you what you want on this countdown! This is really awesome. 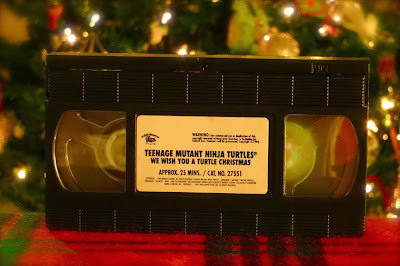 Brings back memories of VHS, Christmas with one of my favorite childhood heroes and right on time for the holidays. 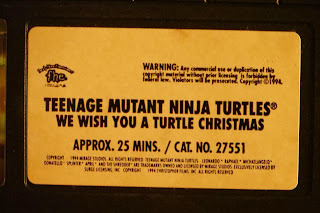 My VHS collection feels lacking without this title in it! Looking forward to the rest of the countdown, awesome idea! Wow.. 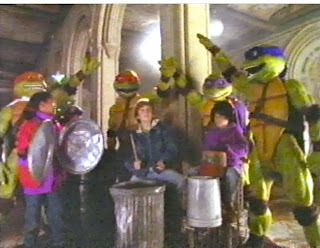 I actually remember this. 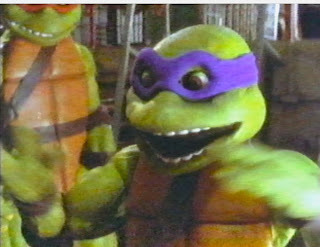 My bro watched it all the time back in the day.